Apparently, drinking Bud Light means you’re “#up for whatever” and the Bud Light bottle made it clear that you’re supposed to be up for whatever a man feels like doing to you. Well, it’s over now. 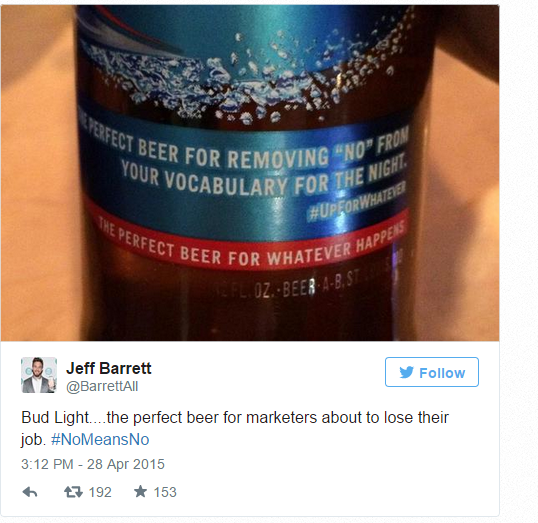 And no doubt somebody at Budweiser has now been fired. Too bad they hadn’t talked to us. We’d have been happy to come up with a slogan for the beer bottle label that would increase, not decrease, Bud Light’s share of the female market. Luna Bar: THE PERFECT ENERGY FOR REMOVING ASSHOLES FROM YOUR PERSONAL SPACE FOR THE NIGHT.